It was a sight to behold: a metallic yellow Ferrari F12tdf sparkling in the sunlight on the roof terrace of Milan’s trend-setting Galleria Sozzani at Corso Como 10. An unusual but intriguing picture. But how did the Ferrari get there and why? 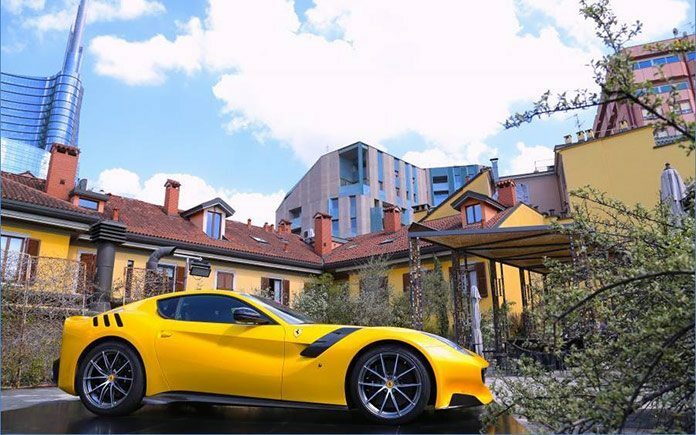 The F12tdf was hoisted onto the building’s roof terrace with a crane last Monday as part of an initiative by the Italian design association ADI (Associazione per il Design Industriale) to celebrate the winners of its prestigious Compasso d’Oro Award. Ferrari’s F12berlinetta won the award in 2014 (one of the few automotive companies to receive this acknowledgement in the association’s history) and was therefore invited to display its creation by the ADI and Galleria Sozzani during design week. Ferrari chose to display the limited edition F12tdf, an evolution of the car that won the award. Introduced last year in a limited series of 799, this high performance Ferrari with its bold muscular shape was sold out before it was even publicly announced. To crown the occasion, a talk-event was held during which Flavio Manzoni, Senior Vice President of Ferrari Design discussed his design process with Enrico Fagone, an authority on automotive design. The evening was attended by a about 200 design aficionados and Ferrari fans.